I have been aware that a craft brewing industry existed for some time and enjoy sampling local beers at area restaurants, but until I read this book, I didn’t know the same thing is now happening with spirits. While there was definitely a need for better and tastier beer (I think back to my college days when the beer choices were the bland offerings from the big breweries, and Coors was the only beer even remotely resembling unique), spirits, on the other hand, already had a wide variety of tasty offerings. So I wondered: Why the boom in craft distilling? Author James Rodewald, former drinks editor for the now shuttered Gourmet magazine, shows us why the craft spirit industry is flourishing. In this unique book he takes us across America and introduces us to several dozen individuals who have chosen to start a distilling business – at times against great odds – and lets them tell their stories. The book is broken into chapters by regional areas and profiles some of the stand-out businesses and their owners. Sprinkled throughout are photos, drink recipes, and short asides with interesting tidbits of information. It’s fascinating that the industry thrives at all considering the mish-mash of laws governing the business. Regulations vary between states, and local ordinances can be challenging; a remnant of the prohibition era. Plus, the small distillers are at a disadvantage when compared to beer and wine producers: laws are stricter, tastings are not allowed, and home distilling is illegal. One interesting observation was that almost every distiller was, at one time, a lawbreaker as most of them had to learn how to distill somewhere before they opened their businesses. 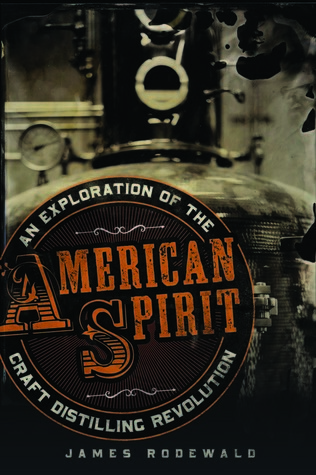 I was expecting this book to be more of a historical account about the world of craft distilling – its history, progress, and where we are today. Instead, I found a book about the people involved in the business rather than a linear history. We do learn about the business, but it is through individual experiences and personal stories; a book those interested in the subject are sure to enjoy. Since we sell beer and deal with distributors we’re aware of craft distilling but don’t know that much about it. This sounds like a fascinating book. I’d LOVE to read this. If you can believe it, in my tiny town we have two craft distilleries. I’m all for this trend.